I really like how you finished this Nicole. That fabric has been a longtime favorite of mine and I just love how it looks with the Watermelon design. The fabric is perfect with the watermelon design! You did a lovely job on the finishing. The pillow is so adorable. Gret finish. I love seeing new ideas. Ann. 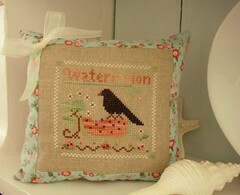 Love your little pillow - the fabric is so pretty around the edges and really makes that pink pop!! Can't wait to see Pear sewn up and your new start. Your Vera Bradley goodies are so pretty! What a stunning finish! What a lovely fabbie too! This is a fabulous finishing job! I LOVE Vera Bradley and love that blue and brown paisley. How nice for you! What a great job!! Very nice. It's a cutie! I love that fabric too! Your pillow turned out really cute! I love it! Love the fabric and your finishing is just so lovely. You certainly have been busy. There's at least 3 finishes I have had to catch up on. Great finishes. I love your little pillow, pretty fabric.